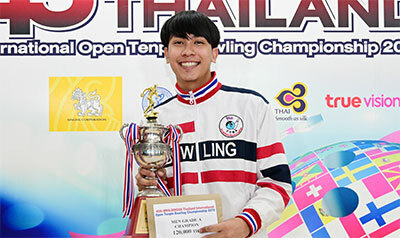 11th April, Bangkok: Phatcharapol Thanomrat of Thailand bagged the Men's Grade A Master title of the 45th MWA-Singha Thailand International Open at Blu-O Rhythm & Bowl Ratchayothin. Phatcharapol got off the block with a superb 231 in his opening game to lead Malaysia's Nurakmal Ramli by 6 pins. Two other finalists, Vipavat Siriphonphaibool of Thailand and Soo Ee Swee also registered good game of 222 to share third. A second Malaysian, Mahadzir Mohd Ali added a sizzling 247 to his 196 opener to take over the lead with Phatcharapol slipping to second and trailing by 12 pins. A third Malaysian, Rodson Tong and Saharat Piyasakunchai of Thailand followed in third and fourth. Mahadzir held on to the lead after another superb game of 224 but was closed in by Saharat after the Thai rolled 247 in the third game. Saharat added another big game of 258 to take over the running. Phatcharapol fired a stunning 268 to move up into second, 6 pins behind his compatriot as Mahadzir and Tong stayed close to the leading duo in third and fourth. The leader extended his lead to 60 pins after yet another superb game of 246. Mahadzir and Phatcharapol both stumbled to a 170 and 175 low games in the fifth but managed to remain in second and third as Tong continued to gain grounds. Saharat could not sustain his hot pace finishing with 176, 151 and 177 in his last three games to drop down to third with 1669.
ahadzir was not too consistent with 211, 166 and 236 but clinched second position with 1683. Phatcharapol ended strongest with 192, 203 ans 229 to capture the title with 1700. Tong missed the podium taking up fourth with 1668. The champion won 120,000 Thai baht (approx. US$3,770) along with a trophy. Mahadzir took home 60,000 baht and Saharat settled for 30,000 baht. Prizes were awarded up to 13th position. Meanwhile 82-year-old Japanese women, Aiko Itagaki upset her stronger male opponenets to capture the Senior Masters crown with 1373, thanks to 60-pin handicap allocated to the champion due to her age. Hairon Awang took the early lead when the Singaporean veteran shot 243 in his opening game but Itagaki soon took over the running after the second game. Macau's Cheng Peng Sheng trailed Itagaki throughout the five games and eventually finished second with 1271. 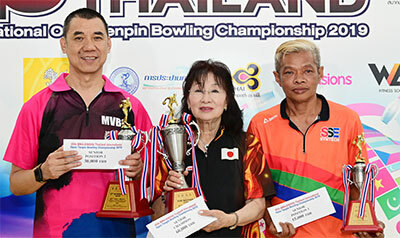 Hairon took third position with 1236 while Thailand's Pollakit Thanasang and Singapore's Jack Wong completed the top 5 with 1223 and 1220 respectively. Itagaki won 60,000 Thai baht (approx. US$1,880) as champion. Cheng and Hairon took home 30,000 and 15,000 baht respectively for finishing as first and second runners-up. Prizes were awarded up to ninth position. Competition will resume with the Open division for the next three days.